For seed and fertilizer, and enclosed gears to withstand the elements. Built with SureSpread technology, you can be assured of an even spread pattern and distribution of product. 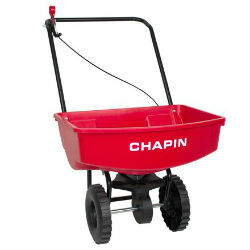 The 65-Pound Lawn Spreader starter model has a 65-pound capacity hopper, powder coated steel frame, adjustable gate with 30 gate settings.